If you're a whisky fan and haven't discovered The Davids yet, I urge you to check out their Spirits Journal blog as well as the shop(s), K&L Wines, for which they purchase spirits. David Driscoll tends to have the more...say...vocal online presence issuing bold, educational, entertaining, and involving posts about the state of the spirits industry. Whether or not one agrees with him, his writings are always engaging must-reads. David Othenin-Girard ("The DOG" for the sake of a terrible metaphor in the next paragraph) is brilliant yet much more reserved when he writes. There's a composed wisdom to each piece he submits. Well, someone just cut The DOG's chain. That someone is Diageo. I encourage you to pause your reading of Diving for Pearls and read the missive missile he launched on Wednesday. His post's title is not hyperbole. Just come on back when you're done reading it. 'Kay? Now, after reading David's post I originally wrote this very piece on Thursday morning in full frustration mode, but decided to hold off posting it. I had hoped that there was some pricing misunderstanding or maybe some bad information communicated to the K&L guys. I even went to the Hollywood store to say hi to David, thank him for the rockin' post, and confirm the news. Well, now I can post this. The Talisker 18yr is one of my top Ten all-time favorite single malts and ironically I had its report scheduled for this week. I bought my bottle from the UK after my birthday in August 2011 for about $90. Just as it arrived, I saw that K&L was selling the same bottle (actually 50mL bigger) for $80. "Crap," I said. I do love hunting down a bargain and here I was buying my bottle for $10 more. Well, now its price has almost DOUBLED in two years. Just for a moment, let's take a look at other 18 year old singles that sell for $150+ and do a quick comparison. Macallan 18 year -- As David mentioned, like Johnnie Walker Blue Label the Mac 18 has become an iconic luxury status symbol. It's the $150-200 malt to be seen with. It isn't necessarily better than its younger siblings, but that purple box is familiar, expensive, and widely available. Talisker 18 does not carry that luxury status, nor is it familiar outside of whisky geek circles. Dalmore 18 year -- Seriously, any company that uses Dalmore's pricing structure as a model is delusional. Springbank 18 year -- Springbank's production is conducted entirely by hand (via hiring local folks) in a distillery with 1/4th the output of Diageo's Isle of Skye computer-run Talisker. When you drink Springbank 18 you are drinking a much more expensively produced dram than any other of its age. And scarcity? Springbank has a very limited malt run; reported shortages of Talisker 18 are either due to mismanagement, a sudden unknown Talisker 18 purchase boom, or a marketing ploy. As of this moment, those are the only 18 year olds at the $150+ range. Well, now apparently we can add Talisker 18 to it. Diageo is making my upcoming boycott easier and easier. They've dumped vats of industrial colorant into Oban 14, they've priced their special releases into one-percenter territory, and they're killing both JW Green and Gold Labels. And I'm not even getting into Kilmarnock, the rigging of a beer competition, the insulting PR (I thought you weren't in the business of selling single malts), and the dead distilleries. I've detailed this rant numerous times, so I won't repeat it. Ultimately, my money will not support a company that has such open distain for its customers and products. The saddest part to me, is that Talisker 18 year old is a lovely whisky and I won't be able to afford it anymore. But there's a little left in the bottle, so let's talk about it. Talisker Distillery was founded in 1830 by the MacAskill family. After it came under bank control, the distillery ownership changed hands a number of times. One of the owners, John Anderson went to jail in 1879 for selling product that didn't actually exist. Another owner, Roderick Kemp sold his shares in order to buy Macallan in 1892. In 1916, Talisker was taken over by a consortium which included amongst its members: Johnnie Walker, John Dewar, and DLC (proto-Diageo). The distillery is now entirely owned by, yes, Diageo. -- Talisker practiced triple distillation until 1928. -- They used their own maltings until 1972. -- This 18yr was first released in 2004. Talisker's malt is known for its bracing peppery kick as well as a generous suggestion of peat. It's also almost impossible to find an independent bottling of it since Diageo rarely sells the malt to anyone other than the Isle of Skye blends. Indie companies have bottled casks of Talisker using subtle names like Tactical, Tallstill, and Talimburg. I'm planning on posting a couple more Talisker reports this year. This is great malt and I'd love to try it in all its many glories! But first, my bottle of Talisker 18. It sat patiently in my possession for 15 months, then I happily shared its opening with good friends. The color is a rosy gold. It's not just e150a, rather they snuck some sherry casks into this. American oak leads the nose, but is far from alone. Orange peel is encircled by mild vanilla, milk chocolate, and cherry lollipops. A floral note is followed by mango and a slight peaty band-aid note. And...sherry. Definitely sherry. The palate though very quaffable, roars with white and cayenne pepper. A little salt, some vanilla, burnt wood, and unsweetened cocoa follows. A bit of peat and a savory note arises after some time in the glass. It's all hot peppery malt in the finish. There's also some of those great orange and mango notes from the nose. It's lightly sweet and salted but mostly delicious pepper. The nose changes gears here. There's still some orange peel, but there's also fruit punch, peat ashes, pencil shavings, leather, dates, and vanilla simple syrup. Now the palate gets more of a cracked black pepper note. It's followed by vanilla bean, granulated sugar, tapioca, butterscotch, and bitter citrus. The finish is now full of peated vanilla ice cream, molasses, butterscotch, and late harvest sauvignon blanc. No, this is not happening. Diageo couldn't possibly screw up their pricing like this. DIAGEO IS WHY WE CAN'T HAVE NICE THINGS! Well, maybe, maybe, I can sell my blood platelets for $150 so I can buy a bottle of Talisker 18! *Sob* This whisky is so f***ing good. Actually, you know what? 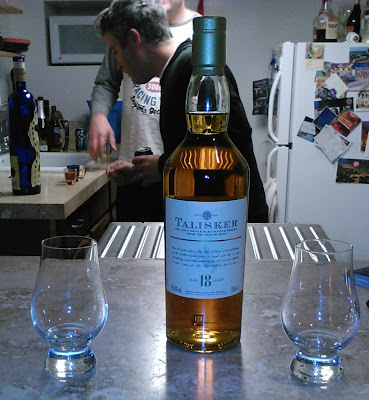 I scored a great deal on Talisker 18 back in 2011 and enjoyed the whisky while I had it. The whisky world is wide and there are so many gorgeous malts, created by non-Diageo distilleries and bottled by dozens of unique companies whose success depends on releasing excellent products at accessible prices. There will be new loves. Sorry, I just had to go through my five stages of grief. I may seek out another bottle if I can find it at $90 somewhere or I may not. It is what it is: A tremendous whisky. Availability - It's around. Good luck. Even Springbank 18 isn't that expensive in the UK (I seriously considered ordering a bottle when placing my down-to-the-wire MoM order). Longrow 18 isn't that expensive in the UK. And with all the crazy indies I could buy with that kind of money (almost half a dozen 40+ YO DT Lonachs), I will take a big ol' pass. I have the 200 mL bottle from my Talisker three pack and that will have to hold me. I've been eyeing all of the above, especially the Longrow 18. With shipping it was in the $120+ range. You scored a good Talisker 200ml pack. The ones I've been seeing recently are the 10, Distillers, and 57 North. Jordan, have you tried any of the Lonachs? I've been considering procuring a bottle of the Strathisla, as it holds a special place in my heart as the first Scotch distillery I was able to visit. Funny, that, Joshua. I just picked up a bottle of the 42 YO Lonach Strathisla. John Hansell liked it a lot and there just aren't many whiskies that old around anymore for so little money (I actually got it for $50 less than the price he quoted). There appear to be a couple 40+ Lonach Glenfarclases and Bunnahabhains floating around Southern Cal too. Both for prices similar to what Jordan referenced. The Total Wines out here have Lonach's 36yr blend for under $100. Dunno the quality of that one, but the price holds one's attention. It'll probably be a while Josh. It's so rare to find these kinds of whiskies that I may be saving them for a while so I can continue to tick of the "drank something older than myself" box. Being a frequent visitor to the Redwood City branch, I often see David Driscoll but don't usually chat him up since he's usually already chatting with another customer or putting new inventory on the shelves. By the way K&L Redwood City is a relatively small store since they are sharing the lot and building with a real fancy restaurant so they have three shopping carts full of wine bottles that don't fit on the shelves. Today I overheard a conversation David D. was having with a customer over Diageo (which has become quite the conversation piece these days). Driscoll had the opinion that Diageo would be crashing down in the near future (like some time this year) since they haven't been showing much in the profits lately (I don't know where he gets his numbers from). It sounds like 2013 to him will be a game changing year for whisky. Wishful thinking or whisky miracle? I'm going to start keeping an eye on Diageo's quarterly reports. My only hope regarding this would be that they sell their assets rather than closing them down when times get tough. I just hope that their talks with buying Beam come to nothing. I gotta see the Redwood City store when I'm in town next. The Hollywood one is plenty spacious, with the wine section takes up 90% of the space. And if you plan on visiting the store, don't stare too long at the bottle of Black Bowmore they have in the locked upper shelf. With the price tag of $4,999.99, it's been screaming "BUY ME!" every time I look up. Yeah, I had apparently just missed SKU's prank that day Driscoll was in the Hollywood store. I think I've been to a number of tastings that Sku was also attending, but I have no idea what he looks like either! They have one of that old Bowmore series in the Hwood shop at four-figure price. Great wooden box. A price tag with many digits. I am forced to avert my eyes. That's SKU... umm, no pun intended. I just bought what was probably one of the last 3 bottles in the whole state of NJ just a few months back. I paid $90, but was slightly ticked that I hadn't picked it up for $80 from Shoppers Vineyard a few months earlier(I didn't know they had it). Funny how one's disappointment can turn into glee in such a short period of time. This is my first Talisker 18 and most definitely my last. Glad I at least got to try it. For all of you out there that are heartbroken, don't be. You can pick up a bottle of Bruichladdich 10, Bunnahbhain 12 & Highland Park 12 for the same price. Quite frankly the 18 is very good, but TRUST ME if you get these three for the same price, it's not even a close comparison. Just don't buy into the hype behind all these prices. For that matter Ardbeg seems to be going down the same slippery path as Diageo in my opinion. Thanks, Robert, for your comment! The East Coast does (or did) seem to have a couple of the cheaper 18yrs left. Good score on your part! I agree that folks can (and should) pick up heaps of spectacular whisky for $150 instead of shilling out for this newly overpriced bottle. Hi Anon, thanks for your comment! That's very interesting. I think a couple other distilleries (maybe Dalmore?) have faced similar issues during the drought. Sounds like the Talisker folks chose wisely regarding the water supply. On the branding side of things, they really don't want the whisky to change too much. And on the less cynical side of things, I really don't want their whisky to change too much! Ultimately this is a legitimate issue for a reduction in malt supply. Perhaps we'll hear about this again in ten years? Hope you had a great trip. I'm jealous! Oh man, I bet. For all I gripe about Diageo, they do release some gorgeous Talisker whisky on a regular basis. An oldie at full power sounds excellent. Well... as a Talisker Lover i'm facing hard times as well. The stuff they released lately is just unmature rubbish (from my point of view) and now they also start to do more and more NAS. And since last year their 25yo had a 80% price increase but has been dropped from CS to 48.5% as well. So yes, i'm fully on your side regarding Diageo. Ugh, darn shame. They're basically charging more for less. I'm hearing more and more that the quality of their aged stuff is dropping AND they're pushing half-baked malt with oak tinkering. We just have to see how/if the market responds to this. I don't want them to fail, I just want better booze. So their marketing guys told them:"Hey... lets just drop the age and tell the customers a wonderful story instead to sell our stuff overpriced - Ardbeg did it... we can do it as well". The next thing is... if we sell todays 7yo, 5yo or even younger malt what will be left in the warehouses for the upcoming decades? I'm not sure how much longer Ardbeg will get away with it. There are still a lot of Galileo and Ardbog bottles on shelves here in The States. I don't know anyone rushing out to get a bottle at this point, nor anyone in a hurry to buy a second bottle. Even if Ardbeg's quality declines or if their sheen fades, LVMH's marketing folks can always focus on branding them even heavier towards the luxury side of things. I wouldn't doubt that Talisker's glory days are in the past, though simultaneously I'm sure their prices will continue to climb. "More money for a lesser product" is beginning to feel like an all too familiar theme right now. Here's a depressing (for me) update on this (5 years from above chat): Talisker 18 year at Duty Free in India: $231!! And a ray of hope: 67 GBP (excl VAT) at TWE store last month!! Diageo's prices seem to vary very widely. Here in the US, it differs from state to state because of the liquor distributors. But I don't know why this happens from country to country. My best guess is taxes, import tariffs, etc. Meanwhile the UK has the best prices on Diageo malts overall. 67GBP is very a nice price. $132 in Illinois here in late 2018!